Local fruits, when in season and plentiful, are great for frying up into crispy fritters. In a mixing bowl, combine the self-raising flour, rice flour, and salt. Mix well. Add coconut milk, mashed durian and sugar. Mix into a sloppy batter. Heat enough oil for deep frying in a wok over medium heat. Use an ice-cream scoop to scoop out the batter and drop into the hot oil. Do this in batches so you don’t overcrowd the wok. Deep-fry until the fritters are cooked through and golden. 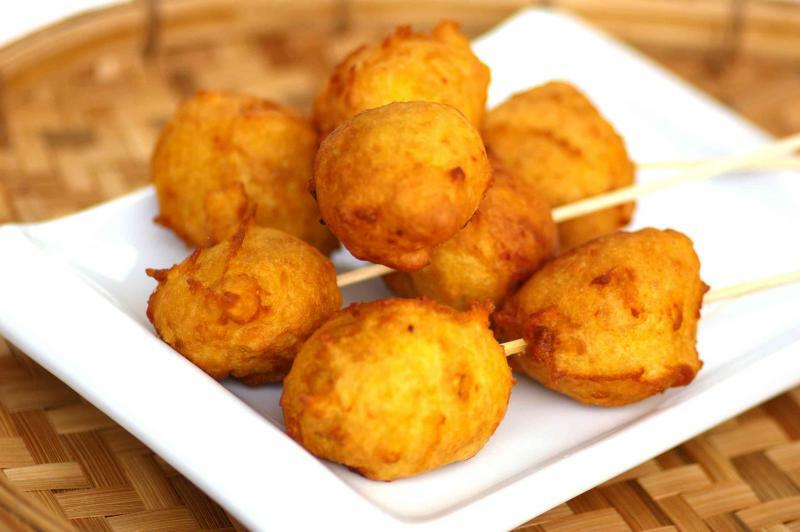 Remove fritters as they cook and drain on paper towels. Cool slightly before serving – threaded through bamboo skewers if you like.